Neil Reynolds admits he had a little wry smile to himself as the final whistle sounded on Saturday at the Sir Tom Finney Stadium. The Bamber Bridge boss had spoken in the build-up to their NPL First Division North fixture against Ossett Albion of the need to grind out wins when the chips are down. Lo and behold, his players answered their manager’s call as they secured a scruffy, but vital, 1-0 win over the Yorkshiremen. Reynolds said: “It’s funny – one of the first things I thought about after the match on Saturday was what I had said to the Press during the week and the need to grind out results. 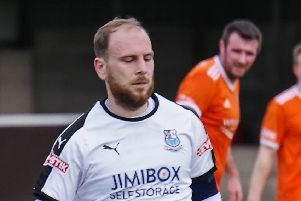 “It’s okay putting six past Goole and four past Kendal when we’re at our fluent best, but we needed to start showing that we can get results when we’re not at our best. “We had to show a different style to our game on Saturday because we were not at our best against Ossett. “They came with a game-plan but we had to stay patient, not get anxious. If Brig’s dogged determination was on display on Saturday, then their attacking flair came more to the fore on Tuesday night as they walloped local rivals Clitheroe 3-0 at Shawbridge. Returning to the club where he starred for many years as a player, Reynolds received a nice ovation before kick-off, although the home fans were not too impressed by the final whistle. This weekend, Brig host Brighouse Town at Irongate for a second time this season. The two sides only met last month in the FA Cup – a match which ended in a 3-2 win for Brig. “It was two moments of brilliance by Jamie Milligan which won us that game,” said Reynolds. Brig captain Matt Lawlor could face a spell on the sidelines after suffering a suspected eye-socket fracture against Ossett. The central defender is awaiting the results of a scan. With Josh Heaton on loan at Congleton Town gaining some match fitness after breaking his collarbone during pre-season, Reynolds swooped for Fleetwood Town defender Lewis Baines on a 28-day loan. Matt Mahoney returns to the squad on Saturday after suspension.